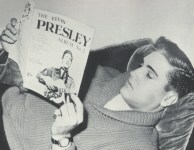 Erik Lorentzen , a native of Oslo, has been an Elvis fan since 1956, when aged seven, he first heard "Heartbreak Hotel." In 1964, Erik and his long time friend Arne Metzner, founded the Norwegian Elvis Presley Fan Club and his work with this organisation gave him the opportunity to see Elvis in concert on several occasions. He was there when The King rocked Madison Square Garden in June 1972 and the following year, Erik met his idol backstage at Nassau Coliseum in New York. He next caught up with Elvis at the Las Vegas Hilton in March 1975 and soon after took up The King's invitation to visit Graceland.